Back in the days when Marina del Rey was famous for being the center of the "swinging singles" phenomenon, we knocked on a neighbor's door searching for a temporary cure for a sever bout of ennui. We asked "What up?" and learned it was Sandy's 21st birthday. Voila! (Do bartenders still ask to see your draft card to prove that you are old enough to buy drinks?) "Put on your hat, grab your purse; let's go!" We were off to a dive bar in Santa Monica for the auspicious occasion known as the "first legal drink" ceremony. The years flew by and now, approximately forty years later, she is getting married and knowing that the World's Laziest Journalist is functioning in Golden Age of Austerity Budget mode she has made a rather unique wedding gift request. Her wedding will put her into the forefront of the esoteric subject of restoring Cadillac cars and so she asked us to write a column about this new phase of her life. We immediately contacted our e-buddy, British film critic Mike McCahill (Google hint: Mike McCahill's blog) to get his suggestions, and then we set about making up our own list of the best movies featuring a Cadillac in a supporting role. "The Solid Gold Cadillac" from 1955 has to start off the list. "Cadillac Man" and "Cadillac Ranch" were quickly added to the list. We Googled "Cadillacs in movies" and got a very long list of contenders. Since film festivals are becoming ubiquitous, we had a light bulb moment when we started to think about the list and the need to find a movie theater that used to be a car dealer's showroom for that particular brand of GM product. We have a very strong premonition that as soon as we tell her that the AMC Van Ness 14 movie complex in San Francisco was originally built to serve as a Cadillac dealership, we are going to hear the question: "When you were a kid, did you ever dream of becoming an 'impresario'?" Didn't many of Clint Eastwood's films feature a Cadillac? Wasn't he born in Frisco? Doesn't he live in the Big Sur area? If we write a column extolling the idea of something that would be "the Cadillac of Film Festivals" and if some young and energetic entrepreneur steals the idea, that might save the World's Laziest Journalist a great deal of work. Didn't Sandy recently ask questions about how one would go about finding a film school student with video equipment and an interest in cars who might be susceptible to the idea of a cable TV show about running around the USA looking for barn finds? It would be a Barnfind Searching Safari, so to speak. Hmmm. Recently there has been some excitement in the automotive world over the fact that the Chrysler once owned by writer Ernst Hemingway has been found in Cuba and is being restored. 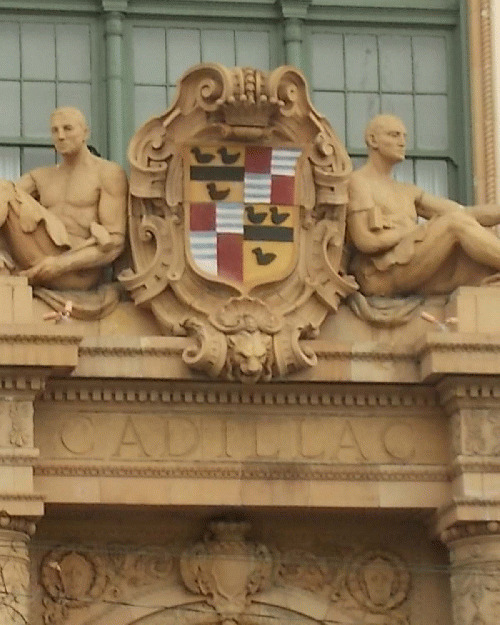 Wasn't Hemingway a famous Cadillac owner also? Would car aficionados like it if a cable TV show about finding barn finds drove a 1959 Cadillac convertible to Key West for Hemingway Days as a way to stir up interest in the whereabouts of Hemingway's Cadillac? Since a 1955 Cadillac El Dorado Biarritz convertible that her husband-to-be owns has been used by the Rolling Stones for a publicity event, we suggested that she and Frank Nicodemus get married in that same car as it rolls along on an open highway. Couldn't the minister drive and recite the wedding ceremony words at the same time? Wouldn't he and the bride and groom, and the two witnesses all fit into the car? Wouldn't local news teams go wild to get footage of that event? Heck if TV can provide coverage of a freeway car chase twenty years ago, they sure as heck could cover a freeway wedding, this weekend.